If you can answer this question easily, then most likely you are getting enough data from your bar inventory system. On the other hand, if your response is, “How would I know that?” – well then you may want to consider upgrading to a more sophisticated liquor inventory system that provides you with more detailed information about the performance of each individual product at your bar. Why Is this Question a Good Litmus Test for Your Bar Inventory System? •	Fireball is extremely popular at the moment – Many bars sell large volumes of Fireball shots, making it a good barometer of performance. If you evaluate a small volume product, you may only be missing a few shots, which won’t give you enough data. By evaluating a high volume product such as Fireball, you can see larger trends. Of course, if you don’t sell a large volume of Fireball shots, simply sub in the name of one of the more popular products at your bar. 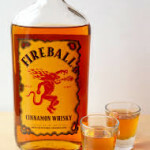 •	Fireball is almost entirely served as a shot – It’s best to choose a product that’s primarily served as a shot since it provides a fair measure of performance. When you’re free-pouring cocktails, there is much greater margin for error – different bartenders use different counts and potentially count at different tempos. But it’s almost impossible to over-pour into a shot glass. This takes away variables such as accidental over-pouring due to lack of training or insufficient pouring practice. •	One week (or possibly two weeks for smaller volume bars) is a suitable timeframe to be doing bar inventory – The traditional practice of performing bar inventory once a month is outdated. When you do bar inventory on a weekly basis, you get much more actionable data that can help you with weekly ordering, identifying which products are big sellers, determining how successful your signature drinks are, and a lot of other important information which will help you maximize the profitability of your bar. •	The answer is easy to verify – Either you know the answer to this question or you don’t. There’s no gray area. If you can’t answer this question, then it is a clear sign that you lack the data necessary to maximize the performance of your bar. Why should I Be Concerned with the Performance of My Bar Inventory System? •	Poorly programmed POS systems – Using a poorly programmed POS system will cause you to lose a dollar or two on many drinks that get rung in. Over time, this will cost your bar thousands of dollars. When your liquor inventory system doesn’t go into enough detail for you to compare what is rung in with what was poured, you don’t have the data necessary to identify opportunities for improvement. Bar-i helps you optimize your POS system in order to capture every dollar. Over the course of a year, this will significantly boost your annual profits. •	Bartenders erring on the side of being too generous – You need a regular feedback loop to determine whether drinks are consistently being poured too heavy. If they are, you can have a conversation with your bartenders to address this situation and prevent the problem from continuing. •	Lack of effective liquor management – An effective bar inventory system allows you to compare how many drinks are rung in with how many are poured. When drinks are given away, your bartenders should ring them into the system as a comp. This way you can more effectively manage the number of drinks given away, helping you establish a healthy balance between your profit margin and the maximizing of bartender tips (through free drinks). Bar-i provides a bar inventory system that allows you to determine exactly how much Fireball is missing. By obtaining this type of detailed information, you can address a wide range of problems at your bar which may be costing you lots of money over time. To find out how our liquor inventory system can benefit your bar and help you maximize profits, please contact Bar-i today to schedule a free consultation. We provide services to bars nationwide from our offices in Denver, Colorado.